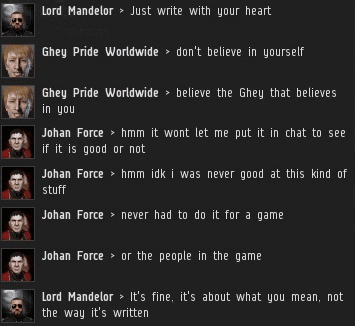 Johan Force spoke for the rebels of highsec when he said he hated the New Order but didn't intend to fight us. Johan's loose talk proved deadly when Agents from the Tengoo Uninstallation Service corp declared war on Johan's corp, Mozzaki United. The Mozzaki mining fleet was nuked in a surprise attack. Johan vowed revenge. 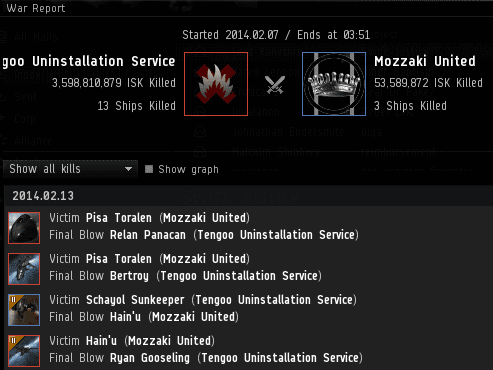 Mozzaki United recruited a bunch of highsec mercenaries to aid them in the war. Now that the carebears of Mozzaki didn't need to do the fighting themselves, they became confident. 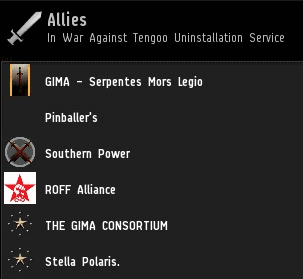 Unfortunately for the rebels, their allies were bested by the Agents of the New Order. After some station games in Halaima, the mercenaries lost a Myrmidon and fled from battle. Now the Mozzaki rebels were on their own. Carebears usually don't go out to fight battles during wardecs. That doesn't mean the wardecs are ineffective or unfruitful for the aggressors, though. Our heroes were able to shut down the Mozzaki carebear operations entirely. 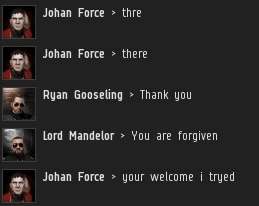 Disaster struck bot-aspirant Hain'u when he attempted to get out of Jita with a Tengu. 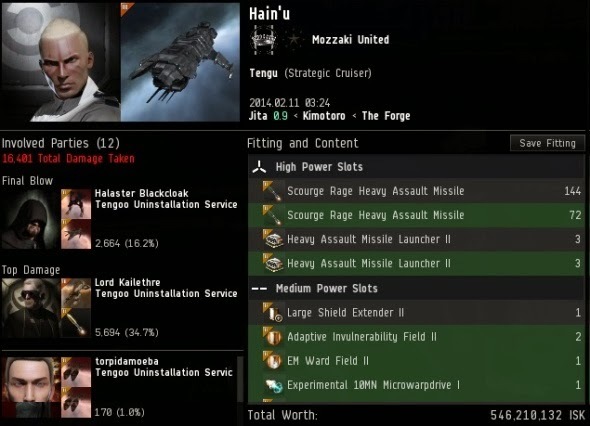 He lost over half a billion isk in an ambush. Mozzaki United was paralyzed. Johan contacted Agent Lord Mandelor and argued that the punishment wasn't equal to the crime. Lord Mandelor considered this, and agreed. Johan's loose talk and disrespect toward the New Order were serious offenses. The punishment needed to be more severe to equal the crime. The war continued. 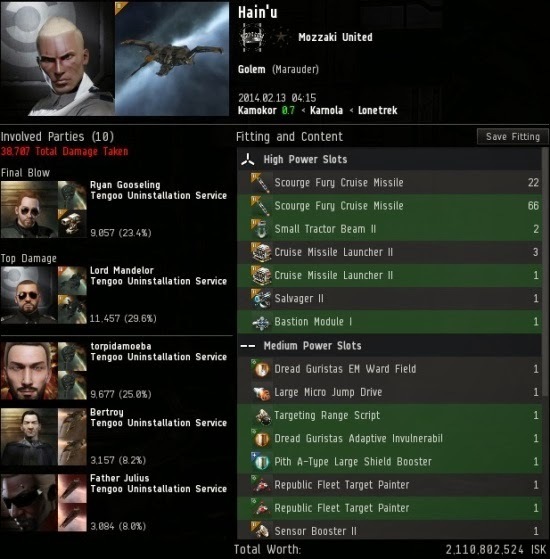 Hain'u was ambushed again, this time in a two billion isk missioning ship. You would think Hain'u ought to have learned his lesson about trying to mission during the war when he lost his Tengu, but no. Bot-aspirants tend to be stuck in their routines (or subroutines). Like so many other "new players" the New Order attacks, Hain'u was an old character. 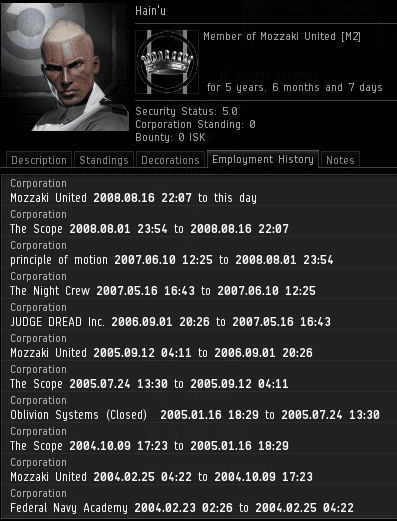 In fact, in a few days he will celebrate his ten-year anniversary in EVE. 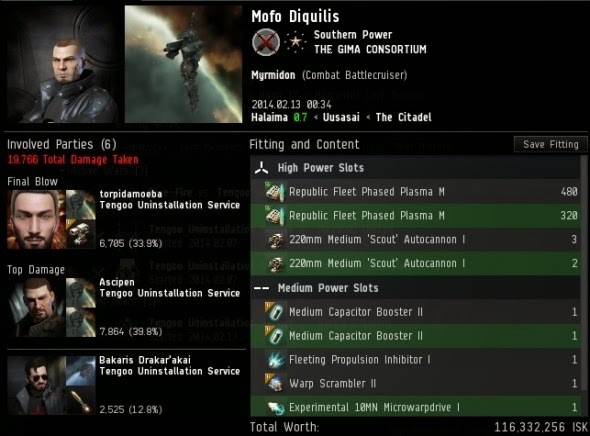 Yes, there are people who willing to spend ten years (and counting) grinding isk in highsec. Incredibly, Mozzaki United predates Hain'u. Mozzaki United was founded in 2003. These people were in desperate need of a Saviour to free them. Despite its many allies, Mozzaki couldn't put a dent in the New Order corporation. Mozzaki's own losses, on the other hand, were staggering and unsustainable. Mozzaki leadership sent Johan out as a peace envoy. Johan was a broken man. In just a few days, he'd been transformed from uppity miner to repentant beggar. Such is the fate of all who would rebel against the rightful rulers of highsec. 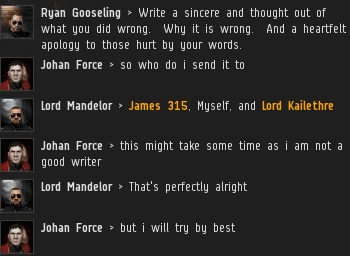 Our heroes instructed Johan to write an apology for saying bad things about the New Order and its Code. Johan wasn't sure he was up to the task, but he didn't have much of a choice. When I received this in my inbox, I had a feeling there would be an interesting story behind it. I wasn't wrong. Johan was relieved when the Agents of the New Order told him he would receive mercy. He'd heard terrible things about us from the other rebels, and was surprised by the compassion he was shown. Not all rebel corps are so lucky. Death Knights University lost its membership when faced with a wardec under similar circumstances. Slowly but surely, highsec is being cleansed. One day it will be completely pure. True but its better than nothing. It's like Lord Mandelor said, it's not what's written that matters, it's the intention behind it. An apology is about promising not to do the offending action again, about recognising the wrong and striving to do right from now on. The words used aren't all the important... It's the actions that follow that count. True, Anons. 8,52 and 10.29. An apology without repentance is half-hearted, incomplete. All hail the true knights of high sec! for the new order! since i am writing here, i am just AFK Mining in the moment and my ships are full to the brim! the stories of brothers grim are more fun. All hail to the idiots! Because the mother of idiots is always pregnant!